My friend A and I are oyster lovers. A put me on to Wapengo Rocks oysters and I’ll hand on heart tell you, they’re the best oysters I’ve eaten. She bought me back 2 doz a couple of months ago and my dad I stood at his kitchen bench shucked and ate the lot in one sitting, sharing a bottle of bubbles. Can’t remember the bubbles, but the oysters were truly memorable. This is them here http://instagram.com/p/qWKemqJpGU/ Good times, good times. When we were wandering down the main street of Bermagui the other day, we walked past the Bermagui Oyster Room and wistfully peered into the front window, gazing at the diners dining on oysters and crisp white wines, in the cool of the air conditioning amongst the clutter free, almost Scandinavian look of blonde furniture and sighed, annoyed that we’d already eaten a seafood lunch at the pub in Narooma. Oh, well, another time perhaps. We kept wandering with our two girls, down to the little take away store to get them an $8 iced chocolate and a coffee for us, but they were too busy to serve us so we left. The girls would have to suffice with a tub of ice cream from the corner shop, and A and I decided, what the hell, we’re on holidays! We can eat as much seafood as we want! And we strode straight back to the Oyster Bar. We’d missed the lunch menu as they only serve from the bar menu after 2.30, but no matter, our mixed dozen that we shared were sublime. I forgot to take a pic of the menu, so I’m guessing here – we ordered a mixed dozen of Premier oysters and had 3 soy, wasabi and spring onion, 3 pink mignonette, slightly vinegarish with shallots and 3 with a tomato sauce based on a cocktail sauce. My fav were the cocktail sauce ones, the piquancy worked a treat with the salty irony taste of the oyster. Gee they were good. Close up of the soy wasabi, matched perfectly with the glass of Chardonnay that I ordered. A had the pinot gris with hers. At $50 for the two of us, it was money well spent. 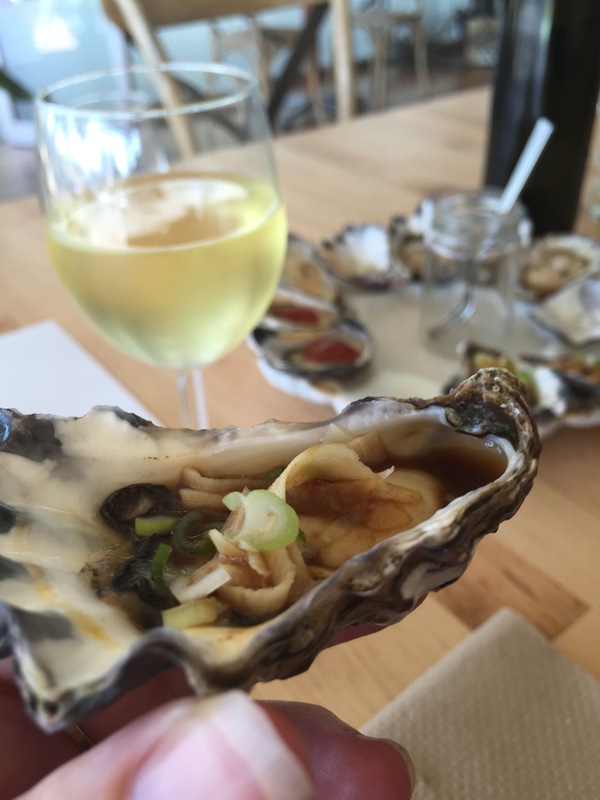 A brief interlude with lovely wine and awesome fresh oysters. Those moments that make your holiday down the coast memorable. The menu has a small but interesting amount of plates to share, and considering it’s an oyster bar, there is nothing much else but oysters. You’re not there for a steak, though, are you? If we’d had a little more time on our hands and not had two long suffering tweenage girls with us, we probably would’ve ventured further down the bar menu. I’d happily get back in the car to drive back down for an overnighter, just to get me some more of those Wapengo’s. Oh, and their coffee is also really good. Why was I surprised? 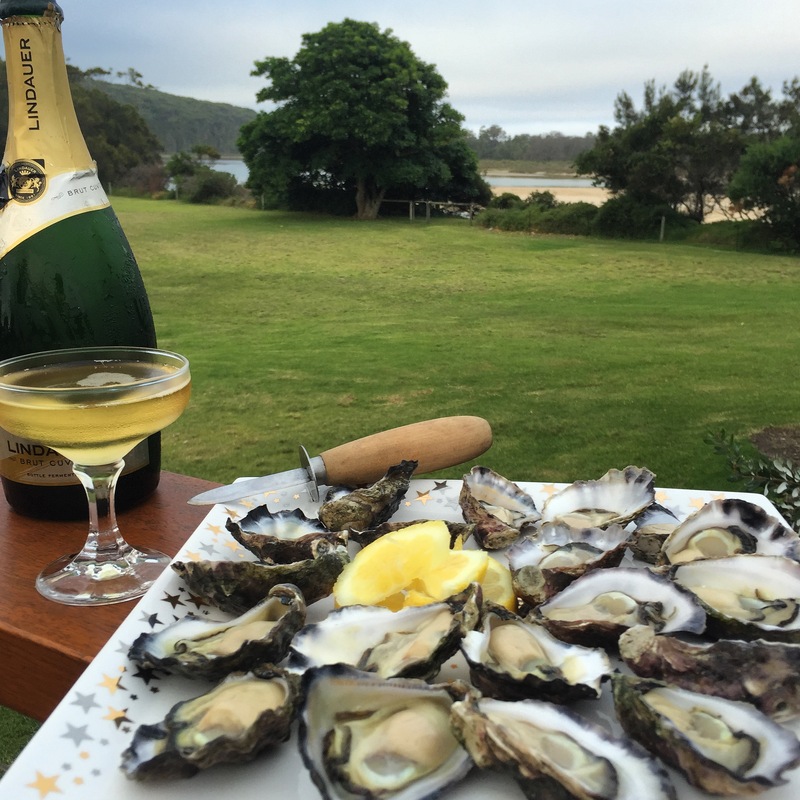 When we returned to our humble seaside abode, another guest of our holiday party had already been into Bermagui and picked up 8 doz of the freshly shucked morsels of mouthwatering moreishness, so we sat on the deck, overlooking the seaside and drank champagne and ate more oysters. Such is life. 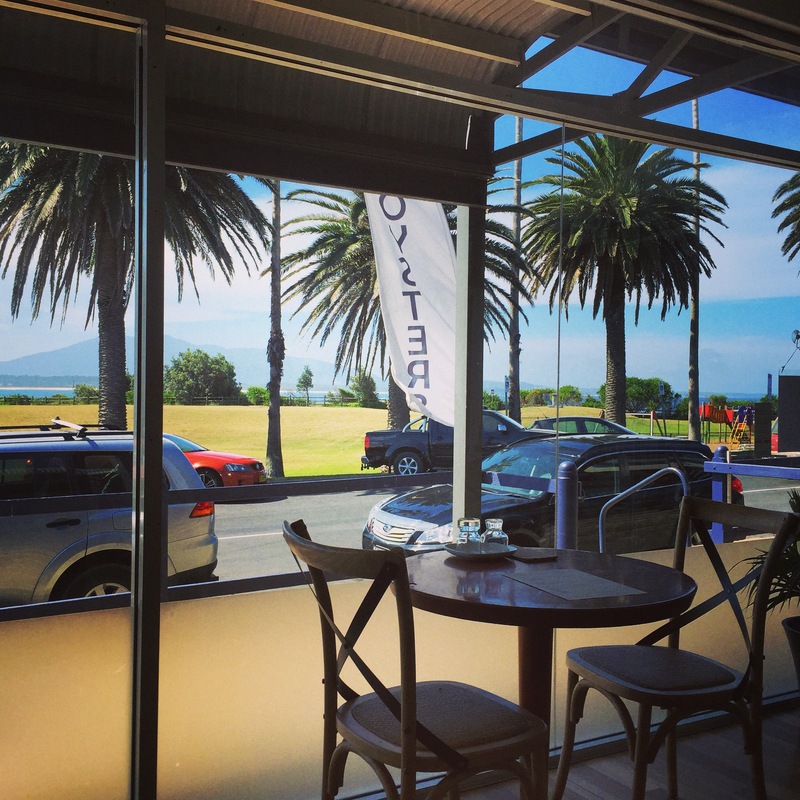 For more pictures of their fine establishment, check Bermagui Oyster Room out on Instagram, or better yet, pop down the South Coast and check em out for yourself. Gary, quite frankly, they’re bloody delicious. looks amazing!! champagne and oysters is a perfect combo. putting this on my south coast list of places to visit. Megan, you absolutely have to. I saw a pic of their dinner menu on Instagram last night and it looks fantastic. I’d happily do lunch and dinner there. By far the BEST EVER oysters in the world. I’m a local south coast lass currently living in the middle of the Gibson desert. 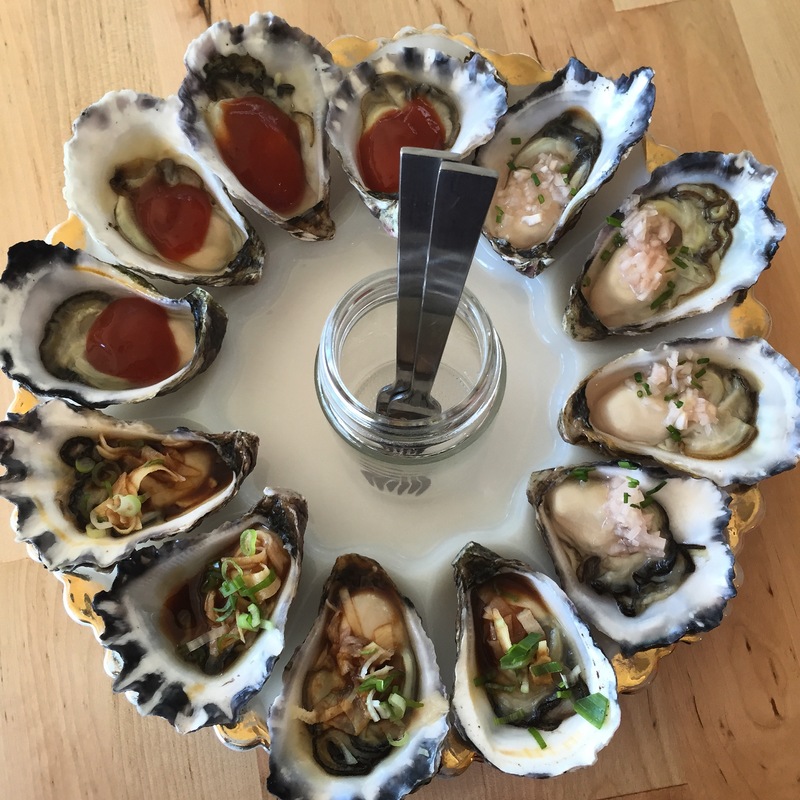 Ma and Pa visited recently and bought with them 5 doz south coast oysters, I cried as ate them they were so divine!! I live here and get to eat them all the time, such a rich flavour with a sweetness at the back of the pallet. Lucky! Canberra is pretty close so I’m lucky enough to have had them a few times. We need more restaurants in Canberra serving them, though, I reckon. Terase, it’s such a lovely little restaurant too, isn’t it? Such a great idea, the perfect holiday spot. I would have to say that Wapengo Rocks oysters are the BEST I’ve ever eaten. Lovely post. Thanks Liz 😀 They sure are!